The terror masters of ISIS are determined to get America's attention. They’ve humiliated the Iraqi Army we trained and seized territory in Iraq that we had secured at the cost of so many American lives. They’ve beheaded American journalists on camera in a direct challenge to the power and resolve of the United States. And now ISIS is calling for "city wolves" across the United States to act on their dedication to the Islamic State’s blood-drenched ideology and murder innocent American citizens at random. Who is ISIS? Where did it come from, and what is driving its successful campaign of murder and conquest? Our government and our media alike seemed to be blindsided by the Islamic State’s blitzkrieg-like advance, which forced American troops back into Iraq. ISIS has conquered a territory roughly the size of the state of Indiana, rules over eight million terrorized souls, and has even revived the practice of legal slavery. And yet the true motivations, inner workings, and future plans of this terror state and its mysterious caliph seem almost as obscure as when ISIS first burst onto the world scene. 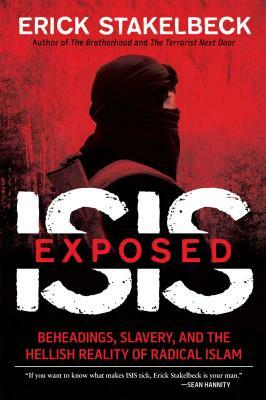 In ISIS Exposed, veteran investigative reporter Erick Stakelbeck gets inside the story of the new caliphate and reveals just how clear and present a threat it is. Erick Stakelbeck is a sought after authority on Middle East and national security-related issues with extensive experience in television, radio, print and digital media. Since 2005, Stakelbeck has been a correspondent, host and terrorism analyst for CBN News. He covers the global war on terror, U.S. national security, the Middle East and the growth of radical Islam at home and abroad for the network's Washington, D.C. bureau. Stakelbeck has interviewed numerous lawmakers and world leaders as well as Islamic terrorists. He's host of the weekly CBN program, The Watchman with Erick Stakelbeck, which is seen on Direct TV, the Dish Network, regional markets throughout the U.S. and in Great Britain, Spain and Hungary. Stakelbeck's first book, The Terrorist Next Door: How the Government is Deceiving You About the Islamist Threat was released in 2011 by Regnery Publishing to major acclaim. His second book was released by Regnery in July 2013 and is titled The Brotherhood: America's Next Great Enemy. It warns about the rise of the Muslim Brotherhood and the global Islamist movement. Stakelbeck has made hundreds of appearances as a commentator on leading national television and radio programs and is a regular guest on Fox News. His blog, "The Watchman," can be found at CBN News.com.